Not sure what more you'd want from a young lad obviously nervous on debut at OLD TRAFFORD in a mishmash of a team that already had the match won. I think he has many qualities. Reminds me of a young Gareth Bale actually. Anyway, hw might takw bit of time to adapt to first team football. I've never understood the hype around this lad. Everything he does is a bit frantic without a plan. I honestly doubt he will be united level. It’s not his fault he isn’t ready yet. People need to stop acting like he is. This Chong kid has great potential. I can see it. He's just not ready yet. But I'm betting he'll be soon enough. World class potential. The only player to ever pass to himself in the FA cup. Nothing wrong with that performance. Decent cameo for the kid coming into a game where the opposition dominated possession. He made a few mistakes but so did everyone else, would love seeing him and others getting more game time with the likes of Pogba , Herrera , Martial , Rashers when games are closed off. I think debuts for Man Utd always have to be taken with a huge pinch of salt! Performance tends to be more about personality rather than ability! Ronaldo and Januzaj (even Gomes) were extremely confident (almost arrogant) kids and revelled in making their first appearance to showcase their skills! For other players that are more introverted a debut is an extremely nerve wracking event! He will be more comfortable with every future performance; what he showed yesterday was well below his Youth league performances I've watched! Didnt watch the game but reading here seemed like he was a disaster. Quite decent and clearly nervous, all his passes were a second later than they had to be. Glad to see Solskjaer encouraging young lads by giving them a few minutes. He needs to play at a higher level and quickly, the reserve isn't good for a 19 years old player. He needs to play week in week out at professional level and it should have been the case for the past 12-18 months. He missed 12-18 months through injury, so although he's 19, his development stage isvthga of a 17/18 year old, depending on how Ole plans to use him, I'd keep him here for the remainder of the season. He came back from the injury more than a year ago, he should have been playing at a higher level than the reserve. It's a general point, PL clubs seem to have the tendency to keep youngsters way too long at the reserve level, when they should be playing against professionals and gain experience. I know what you're saying, but he still lost a year of crucial development. I'd agree sending out on loan in the summer, but to do so half way through the season where it's difficult for seasoned professionals to adapt to a new team, would be counter productive to his development, what we should be doing is seeing how he progresses under Ole for these 6 months and try to get him a decent club in the summer. Got to love this forum. People shouting for youth players, then shouting they are not ready or nothing special when they have an ok debut. I do not see much wrong with his debut. Was not a game where we were attacking much in which he could showcase his offensive talents. Mata made a whooping 17 passes is his 62 minutes, losing the ball on 3 of them. Chong made 16 passes in a half hour and lost the ball on one of them. Mata was also dispossessed 5 times, while Chong was not dispossessed at all. We were playing to bring the game home and Chong dit well in helping to do so. He was in possession in 1,6% of the game which means he was active to get involved. Mata had 1,8 percent and Rashford who came on shortly after Chong only had 0,2% and only gave one pass. That tells you enough about what kind of game it was to come on in. We need minutes of him playing to see how far they've come. Coaches dont. They see him in training all days. Well they did give him 30 minutes yesterday, he's clearly doing something good in the background. Ronaldo wasn't even considered the biggest talent at Sporting Lisbon. Ricardo Quaresma was rated higher. But hindsight is a wonderful thing. There was a time when alot of people on this forum wanted the one trick pony Ronaldo sold and replaced with Aaron Lennon. I'm not really sure about Quaresma being rated higher, but to be fair I don't really remember. Chong is clearly not there yet physically, but he can hold his own. People stating he must go out on loan need to realise that not all youth players are the same and need the same development! From what I seen, this young man is ready for our first team. He is strong enough, fast enough, and can hold onto the ball. He just needs more game time and with our top players around him to see the best of him. IMO, he has ability and He WILL be a very good player for us. I wish the club would hire some of the posters in here as scouts, as it seems they only need to see a 19-year old for 30min in his first team debut to determine whether he will make it at the top level or not. Never mind that the game was practically over and that the team was about as disjointed as it could get with a backline and midfield which were made up of those that both haven't played in a while and also haven't played with eachother (and on top of that all had a poor game). Hardly the ideal situation for a kid to come on and dominate. What makes it even worse is that his performance wasn't even that bad, I think he was more than alright given the situation. Rashford for example looked like a drunk in comparison. Some kids like Rashford will come on to the pitch at Old Trafford and go up a gear or two. Some kids take a little time to settle and show their ability. I thought he was really poor personally. He didn't look anywhere near ready. That doesn't say much about his long term potential mind but it does make the shouts that he should be first choice now look silly. Typical Caf, youth player finally gets game time as everyone wants but doesn't burn it up so deemed 'not good enough' or 'needs to go out on loan'. It's worth noting that we have 2 summer signings who are still adjusting to the pace of the PL after 5 months. You cannot expect too much from a 19 year old who's only just started playing with our u23s this season playing his first minutes in the first team. Let's just settle down and enjoy watching him introduced to first team football and hopefully fulfilling his potential here. So if you have short hair you're professional but if you have long hair you don't? What the feck is that? Chong needs to beef up though. For someone that is going to run at players in the manner that he does, he's going to need to go shoulder to shoulder at times. It's worth noting that Chong hasn't lit it up this season compared to last season. He's still been decent though. I wouldn't make a big judgement on him seeing as it was his debut. He's naturally going to be very nervous and that combined with playing in a higher level, makes it perfectly understandable that he didn't rock the place. Januzaj was the same way btw. He looked very nervous against Liverpool in a cup match. The Sunderland and Southampton performances was after that nervy debut. 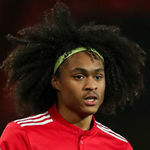 Finally, it's true that Chong doesn't have the level of technique of Gomes or Greenwood, and so because he always plays at a fast paced his touch needs to be tighter. It's also true that it looks like he only knows how to run at players. The same was true of Zaha, granted he had Championship level experience. We got rid of him precisely because we were too impatient. Let the kid develop and make a judgement in 2-4 years or so at least. He has a very slight build like Lingard had. He could be the type that breaks out in a few years. I have a question. Why did he keep drifting inside? I though he was a hug the line kind of winger? Anyone who watches him regularly enough to explain does he like to drift inside like Sanchez or can he hug the line whipping in crosses. Glad he got 30 mins. Self-absorbed look that is very impractical for any kind of physical activity. He likes to drift inside and taking shots, but he can still hug the line and put in cross like a traditional winger when required. It is a truly outstanding post, even by the standards of this place. I actually think he has more chance of making it than Angel. Don’t think this 30 minute tells us much at all. You can take that same logic and say Rashford is useless based on his cameo against Reading. We need to see more of Chong in a more cohesive side, preferably a midfield that has someone with the passing range of Pogba for a few games before discarding his ability. Ole is the right manager for him. Sorry I should have noted that I am not basing this off his cameo against Reading where I actually think he did quite well. You can also never tell from youth level who is going to make it but I just don't see any outstanding traits to his game that instantly fill me with confidence. Angel obviously has an uphill battle based on his stature and I can imagine him ending up being a really fun player to watch at a small club, he definitely has a huge amount of talent though. Really who gives a feck how someone likes their hair? It in no way affects his ability to play football, so is no one else's business. wish we had youngsters like Sancho. Chong looks ok, but all the videos that i've seen of him he just doesn't seem to have the technical ability of say a Sancho. Chong seems to have this weird dribbling style where the ball doesn't look like its fully under his control and he seems to rely heavily on his pace. how is his hair not professional? Nah he does have really good dribbling ability and turns fast in really tight spaces. His touch has been a little heavy at times while dribbling but I think hes still growing into his frame and getting used to it which could be the cause of that. Seems to have gone through quite a growth spurt in the last 18 - 24 months. Quaresma was rated higher, hence he got the move to Barcelona first. In regards to Chong, I think he has more potential than Angel Gomes personally.